Have a look at the list of incredible artists that are coming to spend some time here as part of our Artist in Residence Program. Plan to visit us during their stays! Please support the artists and their work by liking or following them on social media, saying hello and coming to a workshop or artist talk, and tag Curtin Springs Paper in your post about your experience! Keep up to date with the happenings through the residencies in Our News, and on our social media pages. 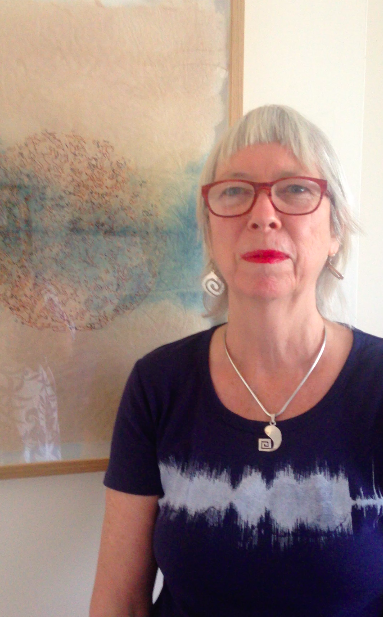 Artform – Papermaker and mixed media artist I am a papermaker and mixed media artist whose work explores material and environmental resonance, vibrations both visible and invisible which connect humans with each other and the non human world. These are expressed through prints, artist books and multi media installations. My existing papermaking practice primarily uses banana plant fibre as well as recycled cotton, linen and hemp clothing. These papers are determined by my current projects, including community paper and print workshops. I am drawn to projects which explore interconnection, between people, places and the cosmos. 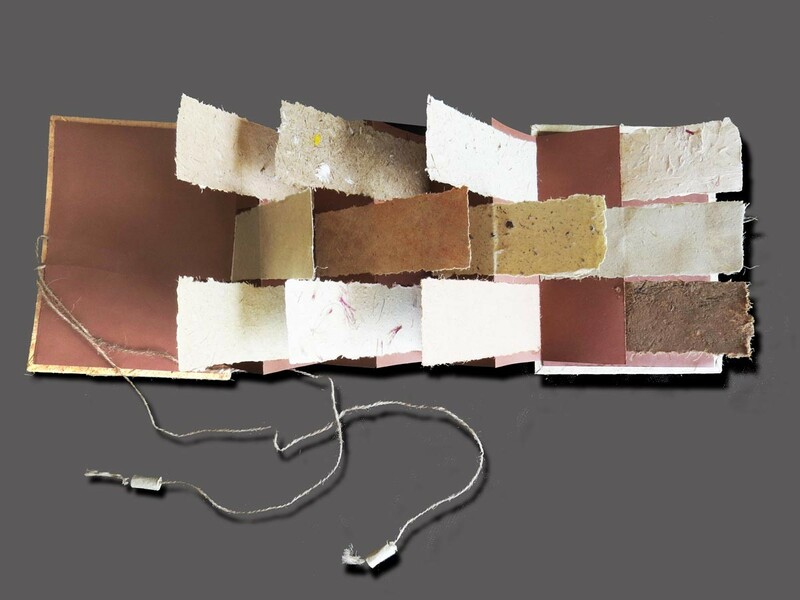 Paper is itself an active material, providing its own sounds and images. I interact with paper through making it, handling it, walking on it, printing on it, moulding it into forms or entering into a collaboration with the material and environment to create marks. For many years I created a small paper collage every day, stitching scraps of paper and paper ephemera like train tickets, torn posters, old prints and repurposed book pages onto a 10cm square piece of paper. A year of these stitched collages was exhibited at the Tweed Regional Art Gallery in Murwillumbah in 2011. More recently I have recorded sounds made during the process of making paper and the subsequent images created from playing these sounds into water. As an offshoot of this research I am now focused on translating the sounds of birdsong and human speech into visual graphics and incorporating these into woven paper artist books. Kneading and crinkling handmade paper using a Japanese momigami technique has extended my paper art into 3D forms which are also an exciting new direction for my arts practice. 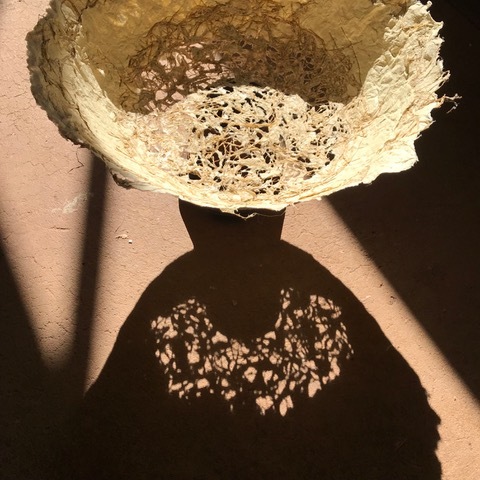 I am looking forward to interacting with the people and desert flora of central Australia to create a stitched and momigamied paper rug connecting fibre, people and the local environment. 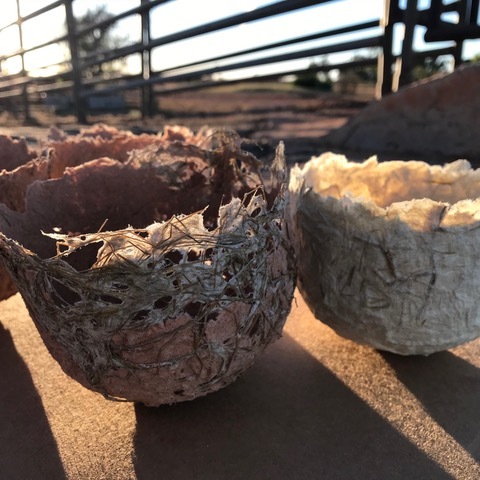 I am also especially looking forward to being in residence at the same time as another fibre artist, to share ideas and to learn about papermaking with the papermakers of Curtain Springs. 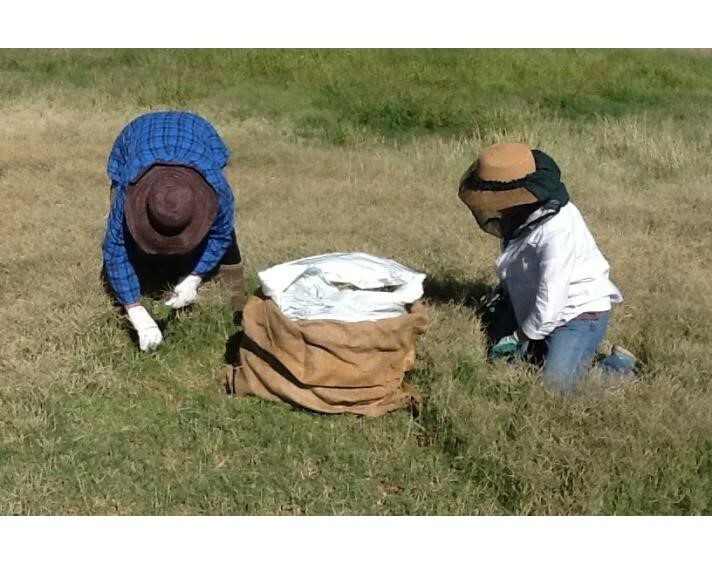 This will give me a great opportunity to experience how Australian native grasses can be incorporated into my own work. 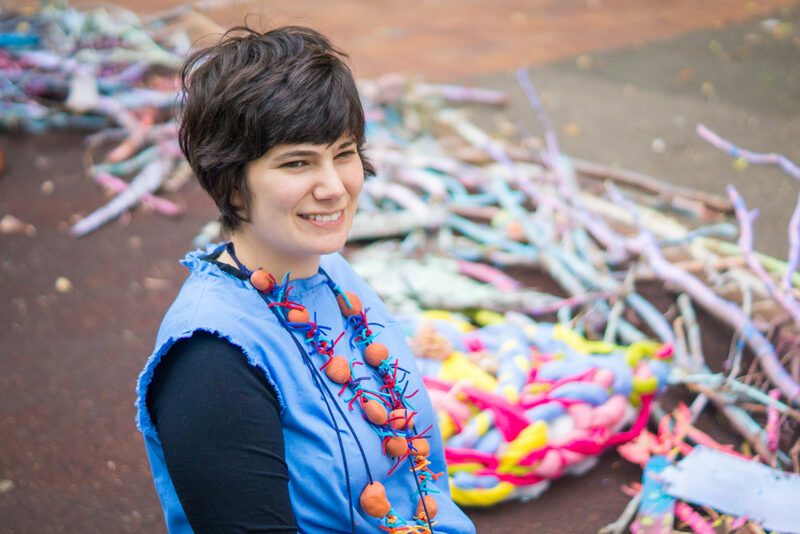 Artform – Sculpture, fibre art I am a fibre artist living and working on the pristine NSW South Coast. The Australian bush and coastal landscapes are an intrinsic part of our identity, informing our lifestyles, and influencing our notions of light and colour. The bush and the sea undergo constant transformation, revealing new sights and treasures for those who look. 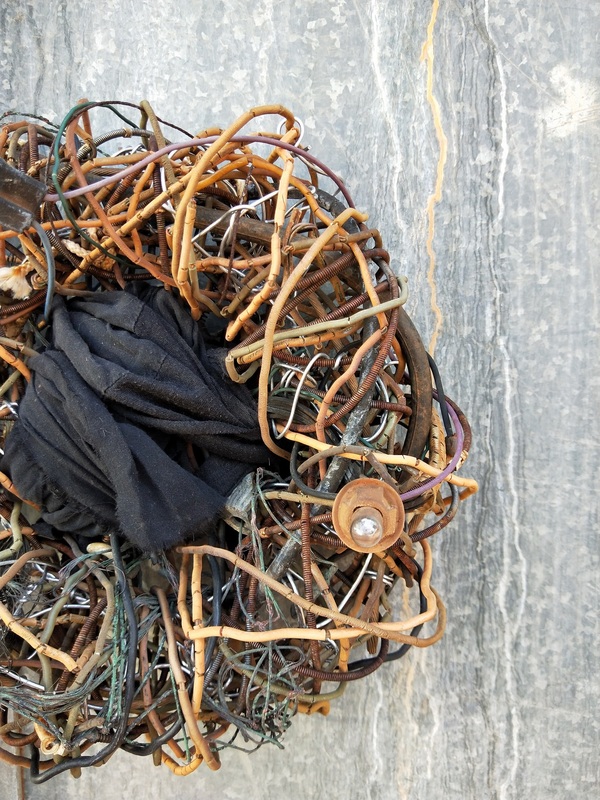 My bowerbird nature comes to the fore and is evident in the bowl of banksia cones, the vase of stones, the pile of metallic, translucent shells and the driftwood that sits by the front door, continuing to bleach and age. Currently inspired by all of that and more, my fibre sculptures aim to capture moments of beauty and transition in the Australian landscape. The textures, the rich colour palette and the complex forms are both a challenge and a natural fit for felt and fibre, which are blended, shaped and manipulated into abstract representations to evoke a memory of our landscape. 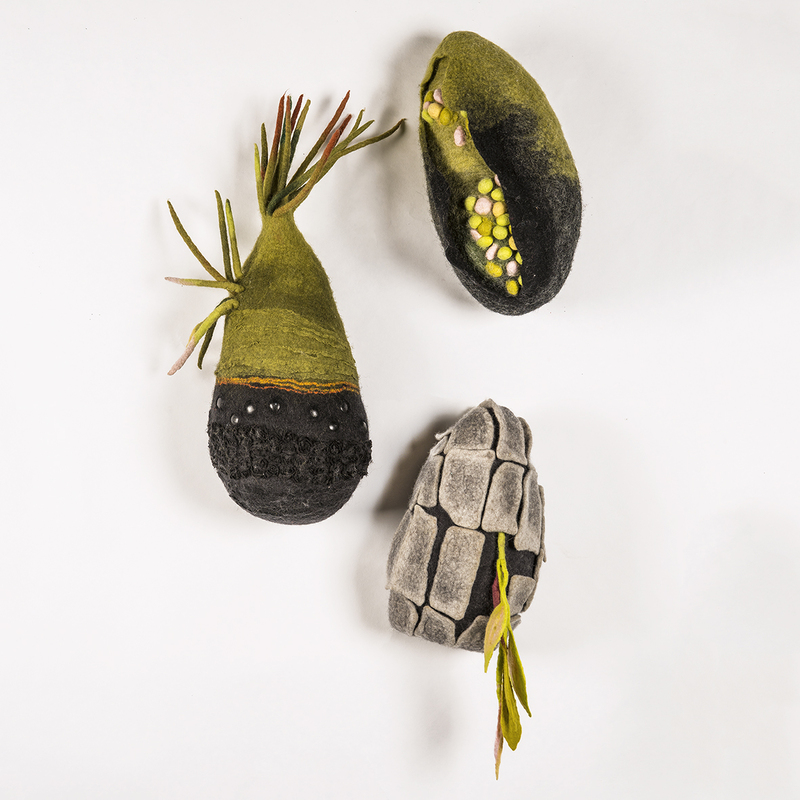 As a feltmaker primarily, I am also interested in incorporating other natural fibres into my works, by experimenting with the relationship that wool forms with other materials – such as the plants that form the basis of the Curtin Springs paper products, and indeed the papers themselves. I am a 2nd year Fashion Design student, currently at Edith Cowan University in Western Australia. I have always been in love with fashion and creativity from a young age. I grew up in Western Australia and have always lived here. I have fond memories of lots of time at the beach and camping around Australia with my family and travelling the world once I finished school. I completed my first University Degree, Bachelor of Science, after I left high-school, and have been working in the healthcare field for 7 years. In 2017 I decided to start pursuing my love of fashion more formally. By this time, I couldn’t ignore the effect of ‘fast fashion’ on our planet and knew that if I was going to join the fashion world, I had to be involved in Eco-Fashion. I have always been a lover of nature and conscious of the environment, so I was overjoyed to become part of the Eco Fashion Week Australia event team for 2017 and 2018. Meeting and working closely with talented fashion and textile artists and designers, I knew I wanted to develop my creative skills, and enrolled in University in 2018. I currently work with upcycling materials and am inspired by the world around me- whether it is nature, or cultural and historical references. I love working with colour and creating texture and 3D scale. I believe art is important for everyone’s soul and clothes should be both fun and expressive- whether they speak about the wearer, the maker, or an important message about our world. This is a rare and special opportunity for a student, and I am looking forward to learning the craft of an artform different to my own, which in turn will enhance my fashion practice. Tamara Russell is a Textile Artist specialising in free machine embroidery and hand stitching based in Brunswick, Melbourne. I explore my surroundings and interpret what I see through the medium of embroidery. In my works composition, I combine light, colour, shape and texture to recreate images that inspire me. I consider myself a painter using thread, an artist painting with a needle. My work has been exhibited in the United Kingdom and Australia. My practice engages with the natural environment recreating the images and shapes in my embroidered works in both 2D and 3D form. I am not primarily a photographer but my photos are invaluable to me as a record of composition, colour and detail, supported by my sketches. Photos are my starting point as I explore my subject matter directly onto fabric, painting with a needle and thread. Each piece uses photography, watercolour painting, beading, fabric, soluble backing, machine stitch and/or hand stitch, either alone or in combination. This creates depth, perspective and richness to the work and combines effectively to give detail and texture. 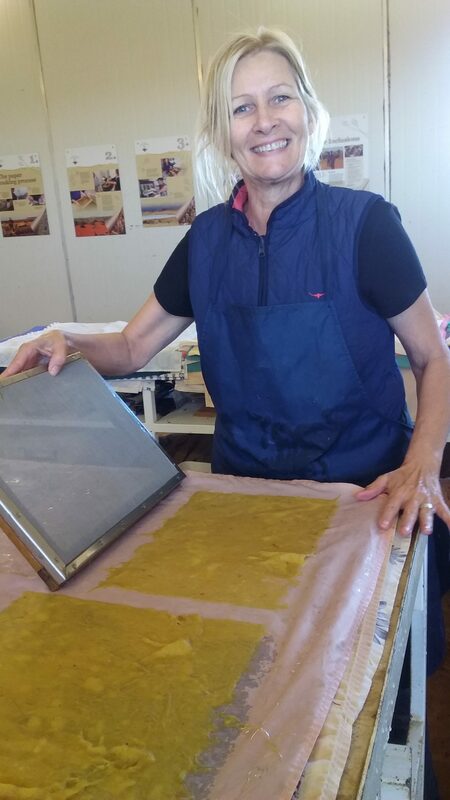 During my residency at Curtin Springs I am looking forward to learn the papermaking process, gaining an insight into local culture and meeting and working with local artists and to gain skills to incorporate into my own arts practice. 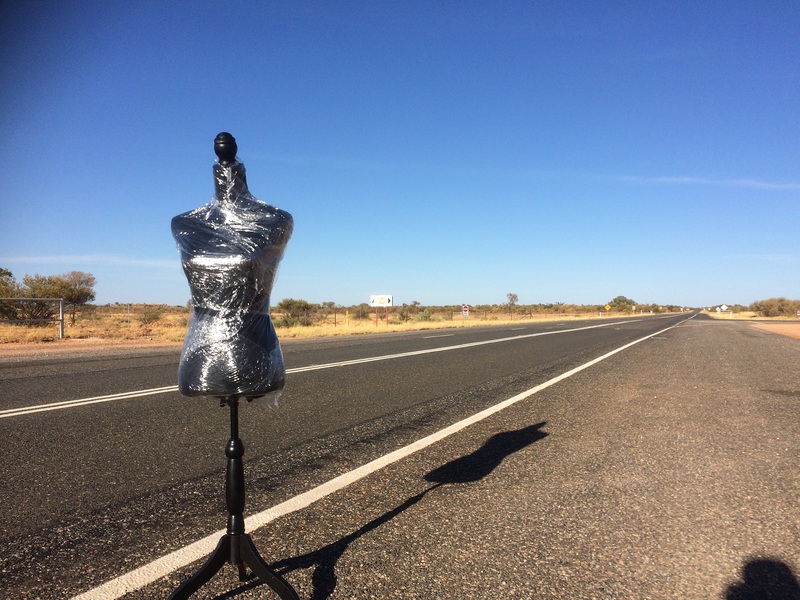 I am also looking forward to creating new work and collecting images and stories to bring home and use to create work reflecting my time spent in Central Australian. I always enjoy opportunities to learn, collaborate and share with other artists. Artform – Mixed Media I make work that ranges from abstract interpretations to representational work. 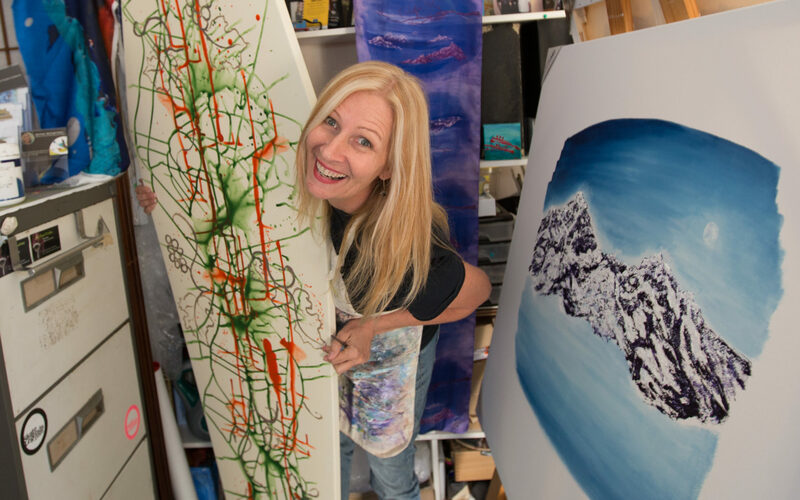 When working on more abstract work, I believe it is important not to control too much but to allow an intuitive response to the unexpected and to keep the energy alive in the painting. I am trying to communicate feelings and experiences, memories, colours. When working on representational work my style can vary depending on the subject and the desired outcome. Currently I am working on a series of abstract works and developing some drawing research for a series of nudes. I also work on commissions eg currently I am working on a portrait, prior to this commission I worked on a painting of someone’s house and garden and before this a painting for a couple who had been married for 50 years and wanted an abstract interpretation of their union and their offspring. I mainly work in acrylics and mixed media – at times using collage elements and embedding objects and paper and glass into my work. I work on a variety of subjects from landscape to florals to still life to abstracts with an occasional portrait. I also work on clay sculptures at least annually. I would like to connect with a part of Australia that I have not experienced before. I wish to respond to this environment and produce artwork stimulated by and with this new environment for me. 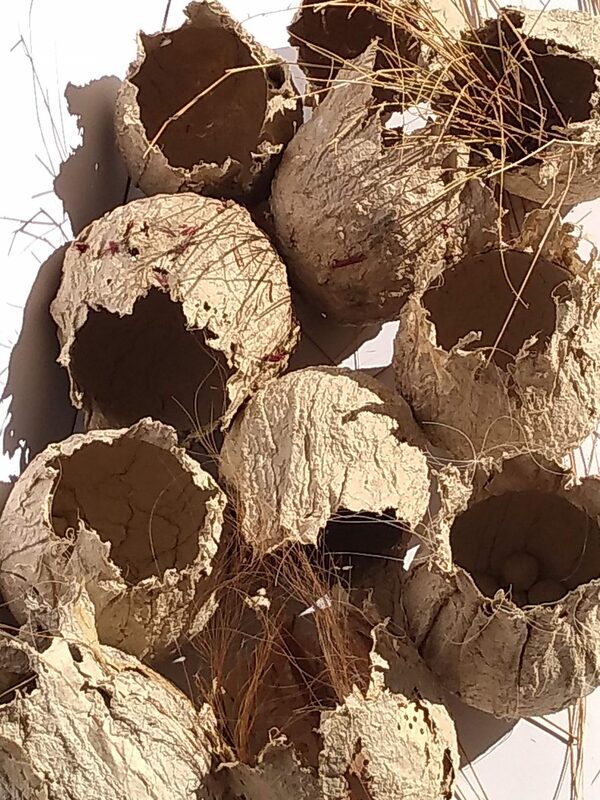 I would like to learn and grow my art practice, drawing from within me and to use some of the local papers and grasses in my artwork – to push me into a new direction and to share my work and processes with others. My incredible stay at Curtin Springs : the gift of nature…..! And the tremendous work of a special family. 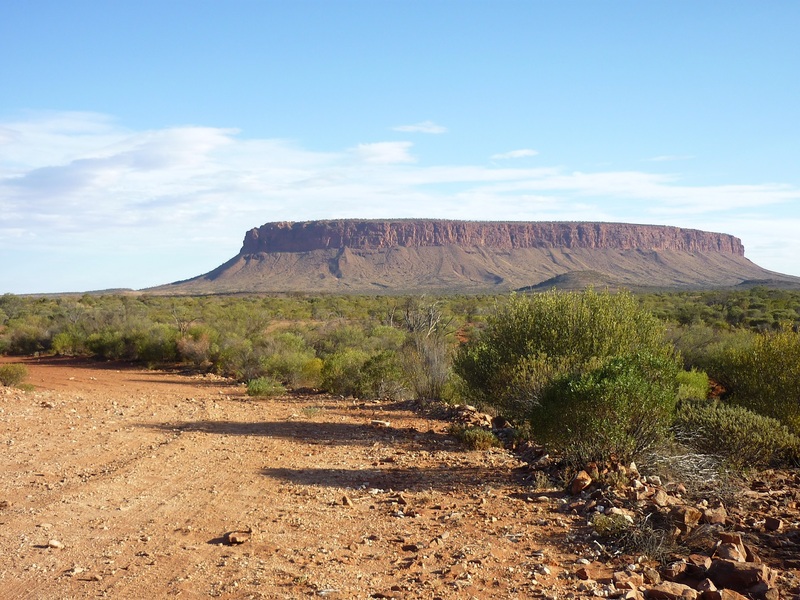 Arriving by car from Alice Springs and discovering the landscape of Central Australia was really amazing : the red Australian desert it is like nowhere else! Arriving to the station of Curtin Springs was unreal and however so real : a dream came true. I had nothing in mind but always ready to explore…..and what an unexpected journey! Daily surprises and astonishing picnics in front of the most beautiful landscapes…it was a wonder to see the hidden camel, emu, birds in the shade of the trees and the tiny flowers and birds, waiting for the rain to come back….And of course, taking care of the cows, or should I say the “Ladies”! In fact it was like creating stories for every landscape for children books like : ” I found a rock in your garden”…..the Mount Conner! The whisper of the « Half Way Tree » which told us the story between work and home…and which kept all the secrets of the History : staying alive! The red sand, the light like the perfume of the wind mixed with the grass of the desert for a unique paper to create and write this precious gift that is life. The sound of the bush trimmer in your hands like a dance with the flying seeds. The taste of the salted lake smiling at us with the moonrise like the mirror of the night. And in your atelier the paper pulp to become the” skin” of the poetry. All the Creation in this unique paper I have been inspired with and which has been given sense to new pieces of artwork for an upcoming exhibition and a special “wedding” between silk and the grass of the desert : inspiration from breathing the desert thanks to you. Curtin Springs : The best way to meet with a new country and to dream awaken of a better future thanks to art and generosity of a special ethical Artist, and a true paper maker Designer. I was really excited to be accepted on the Artist in Residence (AiR) programme, and it more than exceeded my expectations. From the word go we were treated with incredible friendliness, generosity and hospitality from all the family. Amee had her hands very full running the place while Ash and Lyndee were away, but she still managed to find time to take us on amazing trips around the station, show us all sorts of techniques in the paper workshop, and to make sure there was always prepared pulp for us to work. It was great to work with the other AiRs, Isabelle from France and Karen from Tasmania, and of course Amee herself. 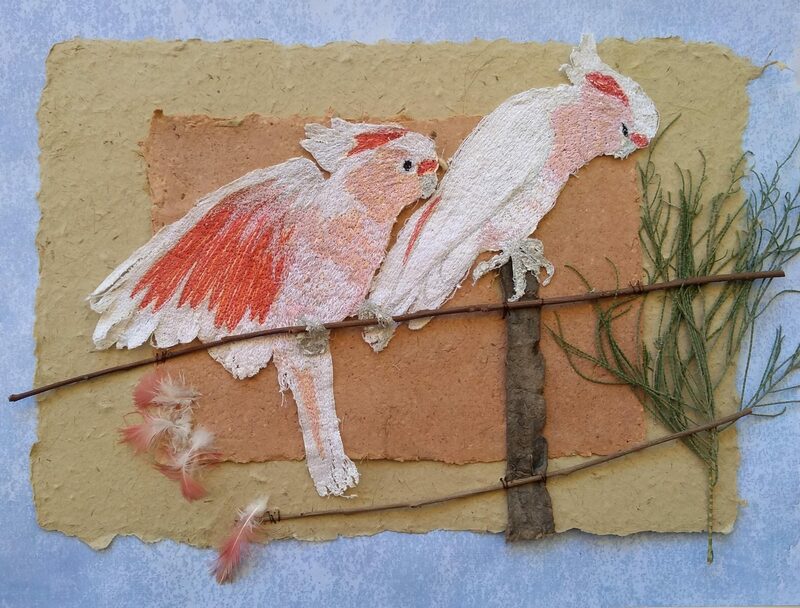 I absolutely loved the paper making process: the creation of paper from the land, with the colours and textures of the land itself, and I came home feeling extremely inspired to develop my own work using some of the papers as backgrounds in my stitched bird and plant collages, and also in three dimensional forms. I have several ups and coming exhibitions and Curtin Springs paper will feature in all of them. I also loved the opportunity to learn about life in this harsh climate, and about the history of the station and how it operates now. The trips out were so interesting in this respect, and also because the land is so beautiful. Not dry and barren as one might have expected of this desert region, but full of colour and adapted vegetation. One of my favourite trips was going out to the salt lake, an astonishing place, where we watched the sun set on one side and the giant golden full moon rise on the other, with Mount Conner in the background changing colour all the time. It was lovely to get to know the family: Peter, Grandma Sylvia, Amee, Emma, Sean, Ben, Matt, and Lyndee and Ash, who were sadly only there for a day before leaving for a short break. We were treated with great friendliness, as we were by all the people working there. My HAIR ( husband of artist in residence) Mike enjoyed working with Kevin on various farm duties such as fencing, gutter cleaning, painting etc, as well as persuading Peter and Sylvia to sit for him while he drew their portraits. We had fascinating encounters with interesting wildlife including perentie of varying sizes, an enormous python, Jack Flash the kangaroo, lizards, feral camels and amazing, colourful birds, both wild and in the aviaries. The flies were not so interesting, but I even started getting used to them! Artform – Eco dyeing and book making On a recent Central Australian trip I collected the odd leaf or two from the ground, and ‘pressed’ them in the novel I was reading. On my return to Tasmania I had a dyeing day and remembered my leaf collection from the Centre. Wow. The colours and patterns produced most vibrant and different to my usual cool climate foliage. Dyeing results differ significantly when using rain water as against sea water. I wonder what effects and differences might be attained using the waters from the variety of bores on Curtin Springs station? Artform – Printmaker I didn’t really know what to expect from my Curtin Springs residency, but it was one of the best things I’ve done. It was very special to be invited into the Curtin Springs family and to hear the history and see how everything works. It was an amazing opportunity to be able to see a side of Australia that those of us who live in the city really have no idea about. My favourite things were making paper (obviously), watching the moon rise over the salt lakes, looking for quandong trees (and finding them! ), sitting under the bough shed (and watching the lady tourists get off the buses in high heels and pastel outfits), the rain and watching the grasses turn green (how special), the red dirt, the goanna that lived under my room, the beautiful sunsets, the cows…… and mealtimes (the food was delicious). And meeting everyone. The image is of the best bathroom in the world. Artform – Mixed Media Curtin Springs AiR programme was my first ever Residency, and it was certainly not what I expected. Honestly I thought I would spend my days independently working on my artworks and making paper. But this was no ordinary residency. The focus was less on building an entire body of work from scratch and more about learning, understanding and experiencing. Half the day was dedicated to personal work and research. The other half was filled with a new adventure. Every question I had about the Northern Territory, Farming, Paper Making and Amee’s incredible fashion career was answered. I experienced long drives stretching to the very ends of the + 1 million acre property. I tasted desert fruit that I had never heard of before. I learned more about paper in those two weeks then I have in my entire life. The landscapes I saw, the people I met, the things I did, all shaped what became one of the most special experiences I have ever had. This opportunity has really expanded my practice. I used this time to push myself, making works based on the landscape with a much broader range of materials then I have ever dared to do before. I am hoping to use what I learnt at Curtin Springs in all my future projects. 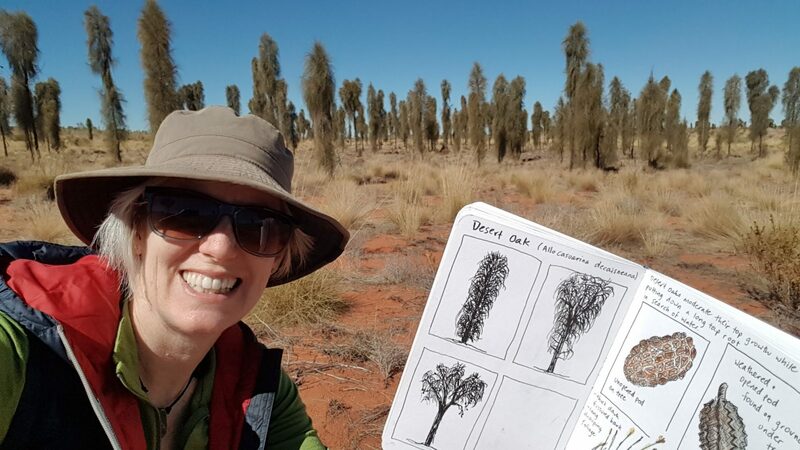 I was so delighted to have been offered the residency at Curtin Springs & this great opportunity to learn the skill of paper making with the natural grasses on the station.I found the whole process amazing & loved using the papers in works I created while in the residency.I very much enjoyed your generosity with the time you spent taking me around the station to the many fascinating sites ,such as the clay pans,salt lakes & the trip around Mt.Conner…I feel very privileged to have had this wonderful experience in the beautiful Australian outback.I have returned back to my studios (painting & printmaking)very enthused to make new works for my upcoming solo exhibition at Orange Regional Gallery in 2019. Being an artist in residence at Curtin Springs was an amazing and inspiring experience! Every day there was something new to see or do. I enjoyed the colors, the space, the beautiful sky, the deep red of Mt. Conner at sunrise, everything! We hiked over several of the salt lakes and saw an incredible view of the stars at night. Not to mention being able to sketch Mt. Conner from Paddy’s Place and participate in making handmade paper from the local grasses. The fact that Curtin Springs is a working cattle station was, in my view, one of the things I loved best about the experience: we were able to ride along in the truck during several trips around the station and we saw a feral camel, emu, a dingo, and a kangaroo (not something we see in the U.S.). I think one of the most memorable moments was sitting around a campfire on the last night and hearing the wild horses coming in to get water: it was too dark to see them but we could hear their hoofbeats in the distance. It was incredible. All of this has left me with wonderful memories of the outback and inspiration that will stay with me long after the residence is over. When I look at my artwork now, after the residency, there is a definite “before” and “after” look: the work is more focused and substantial now–not at all what I was expecting. I knew that working in ink on the handmade paper would be a wonderful challenge (and it was), and I knew that it would give the drawings a more organic look. I also knew that my palette would change dramatically from the cool greens and blues of my Wisconsin home to the red earth and sage colored greens of the outback. But what I wasn’t expecting was the greater substance that the imagery seems to have now, and the greater atmospheric clarity. I think being in such an incredible and vast landscape, and having the time to focus on art and the surrounding area alone, has given me a greater appreciation for subject in a composition, like Mt. Conner: Mt. Conner really was a strong visual element in one of my more recent drawings. The artist in residence experience also helped me appreciate the effect of light and shadow–such as late afternoon or early evening light–on mood within the landscape itself. Overall it was an experience of a lifetime. I understand now why so many American painters, like Georgia O’Keefe, went to the American west and southwest to paint in the early 1900s. It was so vast and remote, and beautiful for that reason! I definitely hope to come back and spend more time in the Australian outback sometime soon. I can’t thank Amee, Lyndee, Ash, Peter, and the entire staff, enough for giving me the opportunity to live and work, very briefly, at Curtin Springs station. I found the experience ‘all encompassing’ – not just gaining knowledge of the process of paper making but also of Curtin Springs Station in all its entirety, the history, the daily running, the cattle, the tourism, managing the fragile landscape and the daily challenges faced by the people who live there. 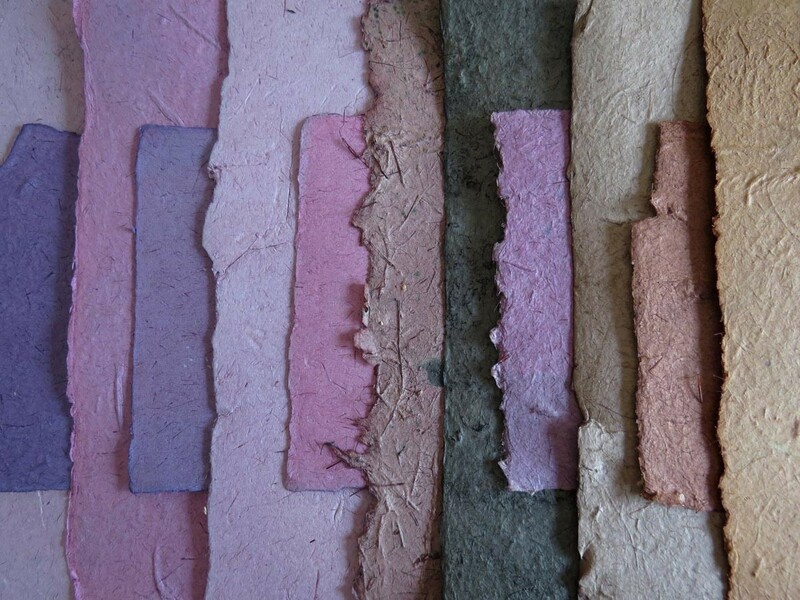 As a visual artist with a keen interest in three-dimensional paper sculpture, it was extremely beneficial to me to learn the process of paper making from the collection of plants in the landscape to the finished product. Before I arrived, I was hopeful of utilizing some of the pulp in the mill to experiment with and this was easily attainable. 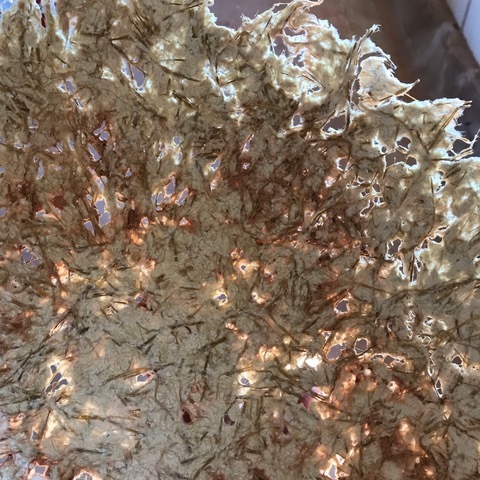 With the use of the space and materials in the paper mill and the equipment I had brought with me I was able to create three-dimensional works on a small scale, which revealed the potential of both the plant fibres and pulp and other inclusions. The use of the paper room was valuable as a dry area to work with the Curtin Springs papers. It takes time to experiment when using new materials and to see their potential and to progress inspiration and ideas. I acknowledge and am grateful for the amount of time generously given to show me around the Station and talk about the landscape, and to stop and look and take photographs. This has had a huge impact and will be vital to subsequent work I produce. Highlights include the Full Moon Walk on Swanson’s Salt Lake, the bbq at Amery with the sunset over the south west of Mt Conner and the starry sky, stopping at the Half Way Tree, and the various tours around the Station including the sunset on the rim rock and alternative views of Mt Conner, also the sunset from the sand dune and textures in the ‘supermarket’. Watching and learning from the cattle drafting have helped me understand some of the hard work and dedication involved in the industry and although challenging for me at times has given me a deep respect for the way of life. On the whole, it was a much more intense experience than I had imagined it would be. The environment and style of living was totally different to my way of life and I did feel complete overwhelm at times. However, being able to step into the daily life of the Station – and not just see it as a tourist – has been a privilege. During the Residency I was able to do a lot of experimenting with the Curtin Springs papers, interpreting my inspiration from the local landscape using techniques I already knew and some new ones (eg. rust transfer and stitching using the bangtails). I will now go on to develop my ideas further into finished artworks. 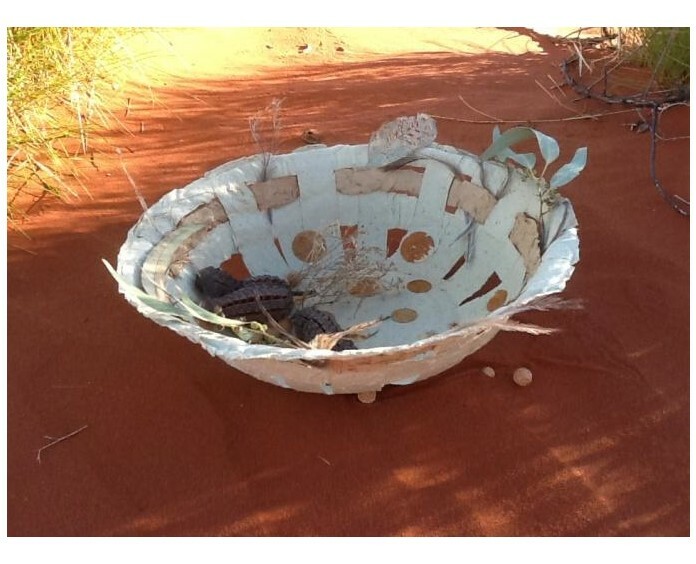 The three dimensional vessels I created at Curtin Springs will be finished pieces once sealed. The colour palette is very different from my work to date and this will be reflected in some gouache paintings, which I will be creating from my sketches and photographs taken on site. I will be promoting my work created as a result of my Residency at Curtin Springs by way of an exhibition, which I am planning in 2019. After the residency, I now see myself experimenting with the process of papermaking from raw materials in addition to re-cycled ones. I am especially interested in cooking the raw materials to the stage of fibres and incorporating these into my current three-dimensional work. 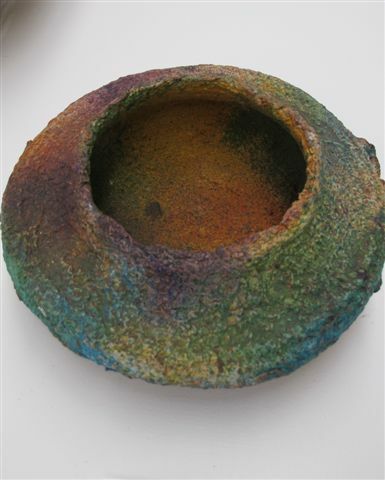 I am also interested in developing my printing skills using both the Curtin Springs papers and perhaps papers I may create from raw materials myself. 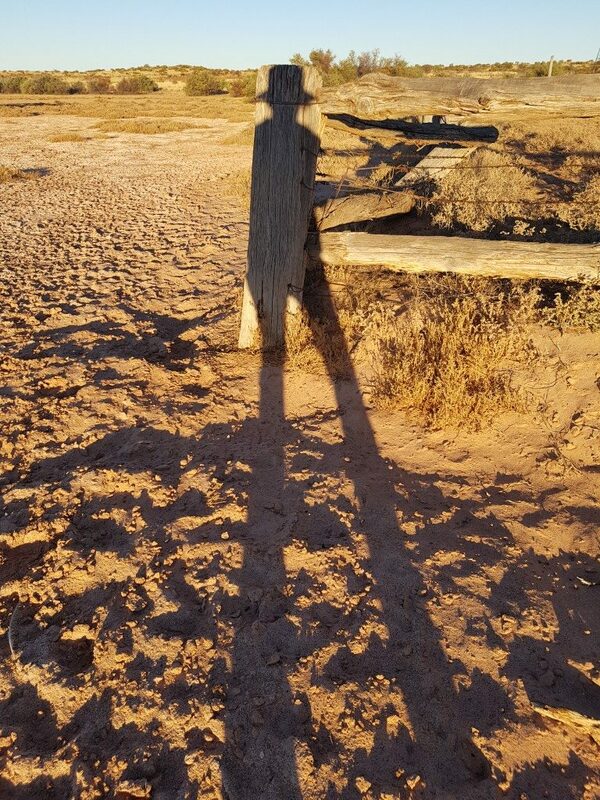 The overall experience of this residency was an amazing opportunity to get away to a unique area of Australia I have only briefly encountered before. The gorgeous colours, textures and dry climate in remoteness is the first obvious sign of difference. Kathy Carter of Recycle me Cards (my co-artist-in-residence companion and fellow papermaker) and I were warmly met by Amee Porter and co-Artist-in-Residence and artist Jasmine Jan and given a private tour of Ayers Rock, the cultural centre and a few stops along the way to begin exploring the grasses of the desert which are used for Curtin Springs Paper. 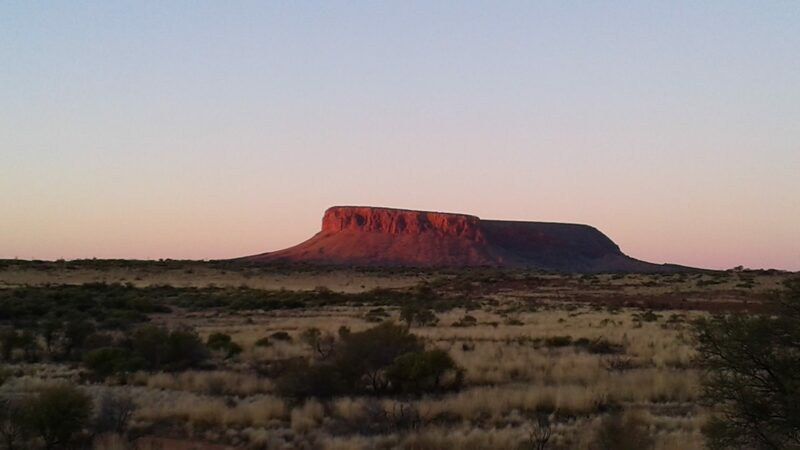 The following days discovering the environs of the area, more of Curtin Springs Station, the Moon Walk and sense of tranquillity which can be experienced here far away from the demands and rigours of modern living which was so rewarding and rejuvenating. The air conditioned accommodation was generous, private with ensuite, a double bed and a spare single bed for laying out art supplies! A fold out table enabled late night private workings and a space to let things dry untouched. The caterings of Mr Ram, Trisha and staff in the kitchen was more than expected with tasty different meals provided daily. The staff were lovely and helpful. The Severin family was generous in their time taking us around the station to check on bores, stock and give plenty of opportunity for photos of this rich, vast unique land. The flies being my only negative so bring a fly net, swaggy hat with corks or whatever works! Amee was giving in her time to show us her processes of bead making both rolled variety, round and rusting techniques. We also learnt her ways of rusting techniques which was interesting and compliments the textures of the landscape for future work. The views while out harvesting the grasses, the diversity of the environment, the textures and colours, all enriched my stay and experience. The papermaking processes, fibres used and workshop experience all different to my own style which was interesting. 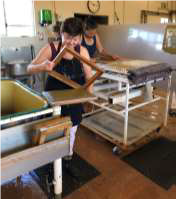 The papermaking experience differing as it is part of the tourist industry which is fast paced and constant. Each artist is different and I can see huge potential for the mill, the processes and developments which could further enrich the experience and education of people to reduce, reuse and rethink everyday items with a view to conservation and regeneration of our resources which is a message I share with my students and my workshop attendees. The natural gifts of the region abound with wild flowers, fauna like the dingo below and many bird species in their natural environment co-existing happily with a large cattle station living off the land together. A unique experience was to collect the bones of feral camels to be repurposed to the Territory Wildlife Park for the children’s Megafauna playground with Jasmine Jan. As part of the Territory Wildlife Park’s Artist in the Park for 2018 also, I look forward to seeing this develop and use the bones for some future inspired artworks. I enjoyed the opportunity to create a few small pieces while there and had the chance to use Curtin Springs Paper to create a lampshade, greeting cards, bowl and a keepsake book. With the hundreds of photos taken while there, I can use the photo references to incorporate more Red Centre pieces for a group exhibition in 2019 to express a small part of the beauty of the region. 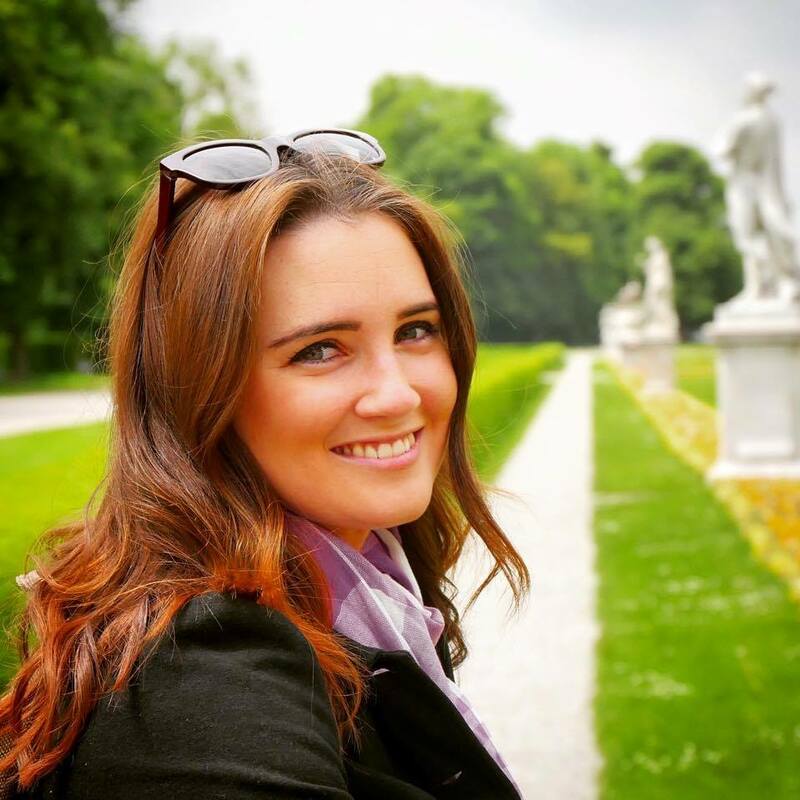 The whole experience was hugely worthwhile, rewarding and enriching to my own practice. Thanks Amee, family and Staff of Curtin Springs for this great opportunity to share your home. 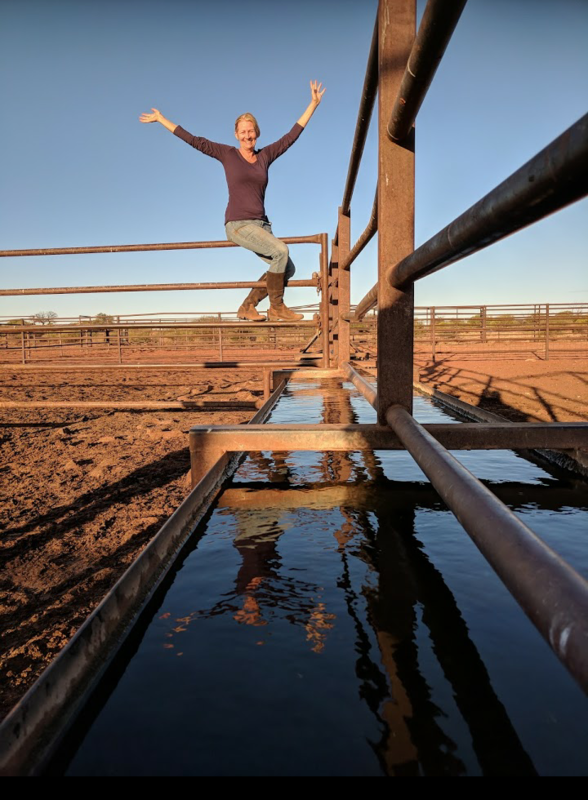 The Artist in Residence experience was an amazing opportunity to see how a cattle station in the desert country near Ayers Rock is managed. That was unexpected; I did not think we would see so much of the property and how it operates. The colours of the landscape, the birds, animals and reptiles were amazing and made for great photo opportunities. To learn about the diversity of Curtin Springs Station www.curtinsprings.com that includes not only paper making using the native grasses but guided tours of their property and the facilities and accommodation options available as well in such a remote location was truly remarkable. Some of the highlights for me were the crunchy walk over the salt lakes to watch the full moon rise, the close up views of Mount Conner, the special BBQ dinner at one of the outstations and just enjoying and observing the busy daily life of the homestead. The accommodation and meals were wonderful and it was great to have our own room and space at the end of the day to just relax and reflect on the day and the experiences and ideas and what you had achieved or where yet to produce. 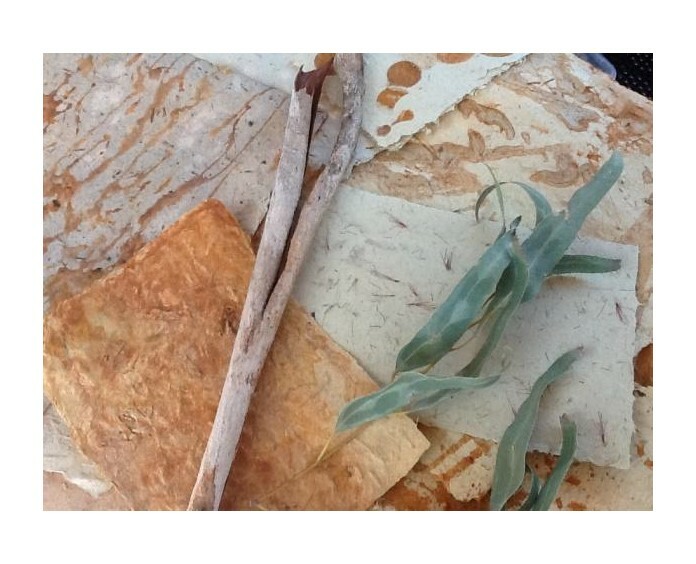 On the artistic side being involved with the whole paper making process from harvesting the native grasses, cooking up the grasses and peeling off the finished paper product was rewarding. Using the old abattoir for paper making, and recycling much of the equipment used in this process, shows just how clever and adaptive people on the land can be. Amee was generous with her time and craft supplies, demonstrating paper rusting and beading techniques, allowing us to use Curtin Springs resources to experiment with additions to our paper making and to produce our own beads, paper, greeting cards, sculptures and even lamp shades. I particularly enjoyed spending creative time with fellow artists in residence artisans, Veronica Hodges www.veronicahodges.com.au and Jasmine Jan www.jasminejan.com.au from Darwin. Jasmine taught me some simple drawing techniques and Veronica and I spent time experimenting with eco dyeing, using such things as leaves and seeds collected on the property. Veronica and I also produced some nice jelly prints on Curtin Springs paper. The artist in residence has enabled me to see a completely different landscape and lifestyle to the tropical north where I live. This landscape has provided further ideas, colours and images to incorporate into my greeting cards for my market business Recycle Me Cards www.facebook.com/Kathymakescards/ and perhaps to diversify into making paper beads as well. I am keen to experiment more with the rusting and bead techniques with my own recycled paper. Seeing on display what other interstate artists and Amee had produced at Curtin Springs at other times was also really inspiring. For instance I would never have thought to include cow bung tails in my recycled paper but I will now! 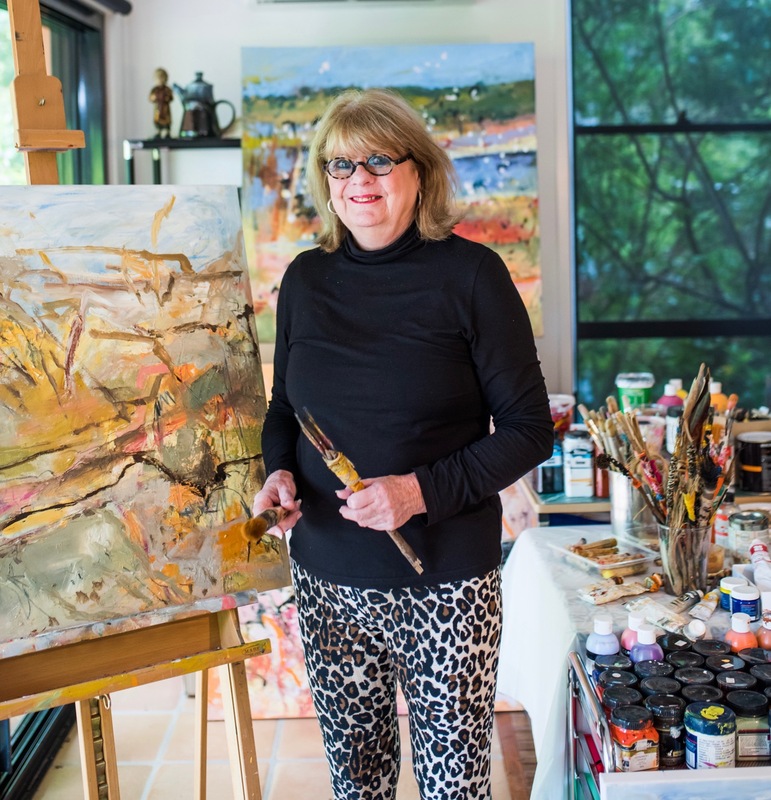 Thank you to the Severin family and all the staff that work so hard to make Curtin Springs the wonderful and successful place it is and for this artist in residence opportunity. 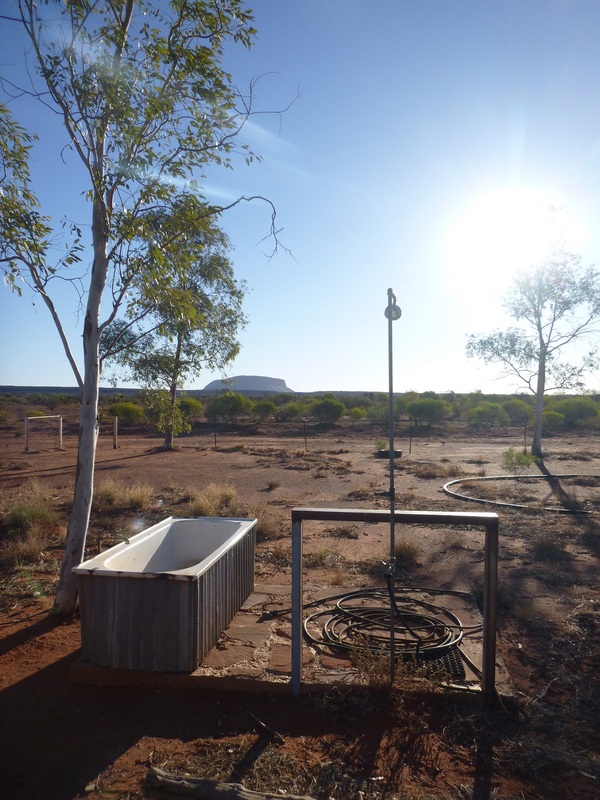 My two week experience at Curtin Springs station was amazing and too short. I was just getting into the groove and then sadly it was time to go home. The desert landscape is just so foreign and completely exotic for someone who has lived their entire life in the wet/dry tropics. The colours, textures and patterns are just so delicious and will provide me with lots of inspiration for the development of a collection of glass beads based on Curtin Springs Station. I am hoping to incorporate the grass paper beads that I made during my stay at Curtin Springs into the jewellery that I plan to make. I will also be preparing a small collection of watercolour sketches on the beautifully textured Curtin Springs Paper to add to your collection of works using the paper. Amee, Lyndee, Ash, Poppa and Emma Daisy were all incredibly warm and generous with their time and their knowledge and made me feel like I was part of the Curtin Springs Station family. I felt so privileged and special that I got to see so many incredible places around the station and both Lyndee and Amee provided such detailed information about all the places, the landscapes, the plants, animals, history and stories about the station. It truly felt like an epic adventure. It was fantastic that I got to share the experience with some fellow artists from Darwin (Veronica Hodges and Kathy Carter) it was great to get to know them both a lot better and I look forward to reconnecting with them both back in Darwin and we can reminisce about our Curtin Springs adventure. 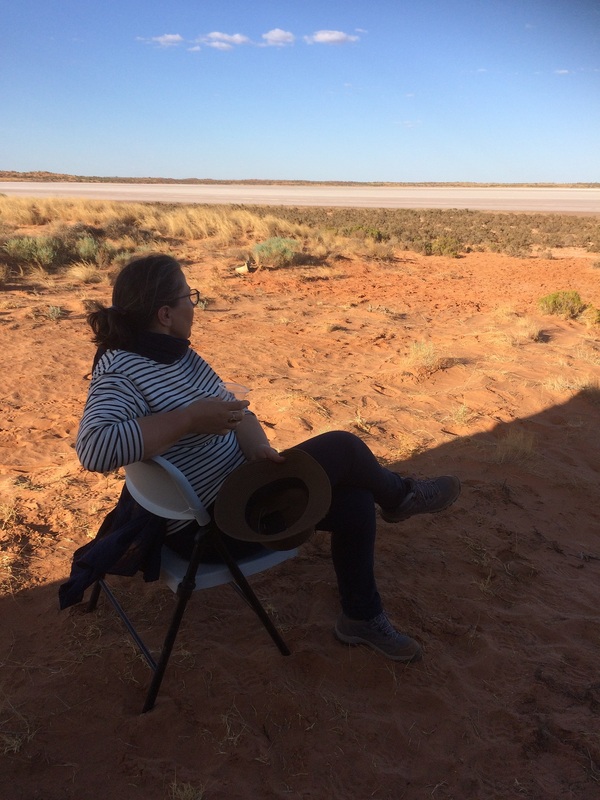 Best part of the Residency was seeing the Saltpans, seeing the ever changing face of Mt Conner (it rained while I was at Curtin Springs…..a rare event), visiting the dam, having the bbq at the outstation, seeing wild Bourkes parrots, Major Mitchells AND Budgerigars in full flight, discovering all the amazing plants and animals that live in the desert, learning how to make paper from the grasses at Curtin Springs, exploring Curtin Springs supermarket, visiting the March of the Quandongs, learning about how the cattle station operates and watching as the cattle were released from the water trap yards but most of all discovering the camel graveyard. I am excited at the prospect of building a “Paddysaurus” fossil to be incorporated into the Nature Playground at the Territory Wildlife Park. It will be a beautiful reminder of my time at Curtin Springs and will bring a little bit of the desert to the Top End. Curtin Springs Station is an amazing place to visit and immerse yourself into a stunning and ever changing landscape. It is a huge privilege to be able the experience this and I will be forever grateful for the opportunity. I have been working with Curtin Springs Paper since late 2014, the year the paper mill opened. Curtin Springs Paper featured largely in my 2016 exhibition ‘Flora’. As Artist in Residence at Curtin Springs I was able to carry out some paper experiments I had wanted to do for some time. I am practiced at the process of natural dyeing and eco printing on silk and wool but I was keen to see what results I would get on the hand made paper. So I set up a little studio/lab under cover, outdoors, where I could safely boil up natural dyes and eucalyptus leaves on a camp stove. These were then applied to the hand made paper. The results were fascinating though not always brilliant. So being first and foremost a ‘plein air’ practitioner I turned my attention back to working in the landscape. It was very hot however, being November, not a comfortable time in the landscape really, so I rose early to beat the heat and flies, drawing upon the beautiful dawn colours using pastel pencils (Pitt Pencils) on spinifex paper. The big skies always delight me at Curtin Springs and we were blessed with some spectacular storms. So I worked each day on drawings of Mt Connor and the so-called ’Halfway Tree’, a singular Desert Oak of magnificent proportions and significance. 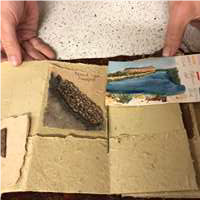 With tourism being such an important part of the Curtin Springs stable I played with the notions of postcards and narrative, developing a couple of concertina books using handmade paper, that bear reference to old fashioned fold out post cards. I will continue to develop more of these over time. As always I took lots of photos and reveled in the good creative company at Curtin Springs. I worked with Amee helping her develop concepts for textiles and clothing for her entry in Eco Fashion Week in Perth, it was fun! Amee is a courageous creative and it’s always a pleasure to work along side her. 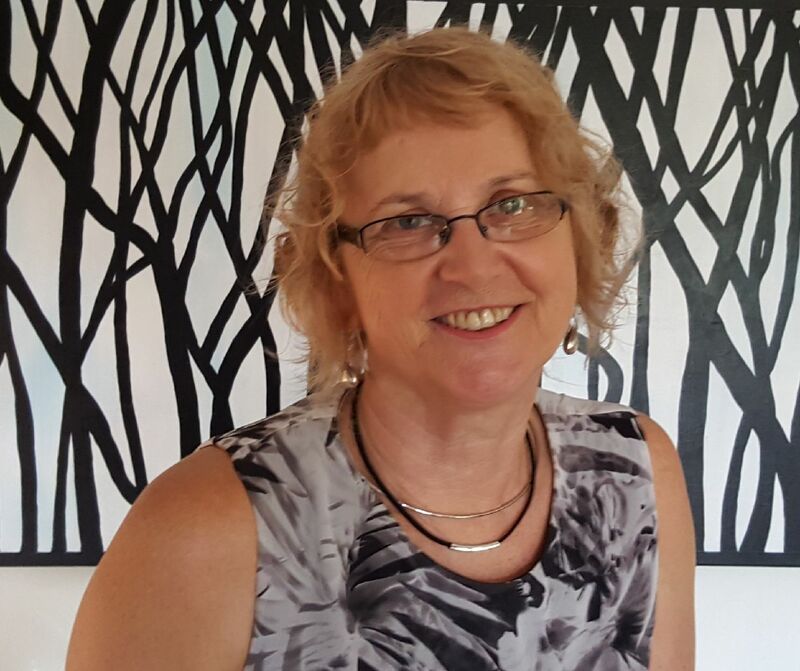 **Deb also has a business called Larapinta Creative Camps, running week long art camps into remarkable and unique places in Central Australia. To have a look at upcoming camps and images and stories from previous camps have a look at the website www.larapintacreativecamps.com.au.